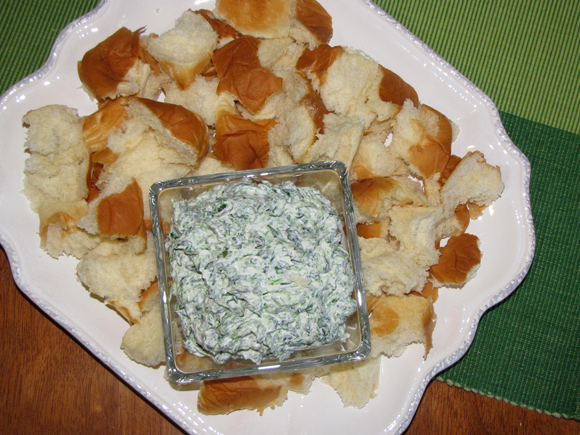 I first made this spinach dip maybe 12 or so years ago. Back when I was younger, I used to work at a semi-fast food restaurant. Man, those were good times with some good people... Anyways, one of the cooks at the time was aspiring to be a chef and he made an amazingly, delicious spinach dip. He gave me the recipe of ingredients, but didn't know how much of anything he put in it. He just winged it. Ugh, right? I mean, I'm all for winging it, but it's impossible to get the same results every time when you do that and even more impossible for someone else to recreate it! You could say it's rather frustrating. Well, it took awhile, but a few years ago - and a few versions later - I finally made that very same spinach dip that he made so many years before. It's the best spinach dip ever and, even though I only make it maybe once or twice a year, my mind never forgets what it tastes like and how good it is. 1. Mix everything together and serve with cut up veggies, pita chips, crackers or Hawaiian bread.